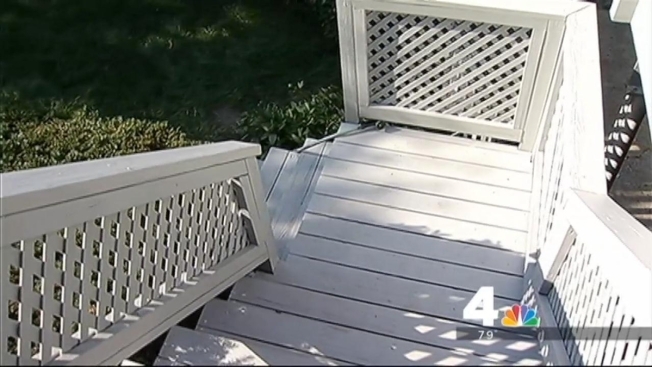 A group of friends relaxing on the back deck of D.C. apartment Monday night was robbed at gunpoint by two men. One of the men was carrying a gun, the victim said. "They said, 'Get on the ground or you're gonna die,'" the victim explained. He also said a 2-year-old child and a woman were inside the home; while he was being robbed, the victim said he hoped the masked men would stay out of the house. The suspects took everyone's cell phones, cash and credit cards, then fled the scene. D.C. police brought a K-9 unit to search for the suspects without any luck. The brazen crime shocked a normally safe and quiet neighborhood, the victim said. "You don't need to [lock your doors]; we all know each other," he said.